I am about to graduate with a teaching degree, how do I get a real teaching job!?!? This is the part where my Googling came up short. How in the world was I supposed to prepare for a World Language interview!?! There are tons of articles out there are about what say, wear, and how to prepare for the general teaching questions, so I am just going to focus on the "language" portion of the interview. I know every school is different but the following options are ways in which I have had to "prove" my Spanish ability. At one particularly strange interview I was told to sit at a desk in a closet and handed a piece of paper where I was supposed to write in Spanish about my past, present and future. How to prepare - If you have been out of the classroom or academic world of writing in the target language like I was (2 years of non-Spanish graduate school), make sure to refresh yourself in the target language by writing and speaking with friends, reading current literature, and listening to your favorite shows or radio. I was told to introduce myself in Spanish to the interview panel. No one in the room even spoke Spanish, so they just wanted to "hear if I sounded like I knew what I was doing!" How to prepare - Have something written up and practiced about yourself, school, and experience, so you do not freeze under pressure and stand there like an idiot. How to prepare - If other language teachers are present and they get a chance to casually talk to you in the target language it will probably be about what language teachers are interested in, Travel! Most of us have the common passion for studying abroad, traveling with students, and experiencing the cultures we love, so be ready to talk about them. This will probably not be the case unless you are interviewing at a dual language school or somewhere where most people speak the language you teach. Administrators do not like not understanding how the questions are answered! How to prepare - Mentally go through some of your answers to the the "typical" interview questions in the TL. It would be helpful to know class size, technology access, level, current unit of study, topic in which they would prefer you to teach etc. If the teacher suggests a certain topic that they would like you to teach, USE IT. They are giving you a huge hint as to what they are looking for. This is your chance to sell yourself to the students, as they will let the principal know what they think of each of the candidates. Conduct the lesson in TL! This is your chance to show everyone that you can teach IN the language, not just about it. 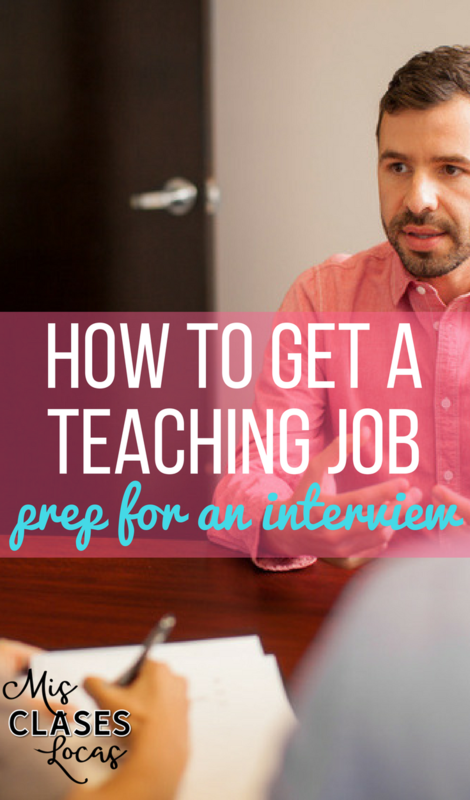 ACTFL recommends 90% of class in TL, and the same should apply for this interview lesson. If you are not given any certain topic to cover, make it something fun, cultural, student centered, and LEVEL APPROPRIATE. Too easy of a lesson and they will not see your true ability, but too hard and kids will shut down. The key to a good teacher is they can see right away that the level is not quite right and immediately adjust. Have fun & show your personality! In this short of a time period, the main goal is not learning a new grammar tense, but showing that you have a passion for teaching. This includes doing an activity in the TL that shows your interest for the subject, using good behavior management techniques, and having positive interactions with the students. Being stiff and dry does not translate well to the students, or those observing. I know you just want me to hand you the "perfect lesson recipe," for a teaching interview, but unfortunately I do not have one. (If anyone does, please send it my way to share with the world!) Prove through your interactions that your heart is in the right place, and this is the school you are meant to teach at. Once you have interviewed the wait is actually the hardest part. Try your best to stay busy and not think about it. If you are then told "I am sorry, you were great, but you will not get the job," know that the right teaching position is still out there for you. Every position will allow you the opportunity to learn and grow as an educator, and as a person. A lot of the interviews I went on asked me about my study abroad experience. I was only asked twice to speak in the TL about how to teach a lesson (one on the preterite/imperfect and one on how to teach a lesson on the family). I am currently teaching French and Spanish so when I had my interview last July, my now chair asked about my study abroad experience...thank god because it was so easy! Thank you for sharing your experience Kristen! Travel is always a popular topic. I hope your year has been going well! Thank you Johnny. What kinds of details are you interested in? Great info! Going through the interview process so for in Texas. Every private school I have applied and gotten the first part of the interview, i have been asked to interview in Spanish with the Department head. Just FYI.